Review: Plague of Spells by Bruce R. Cordell – King of the Nerds!!! Plague of Spells is not a work without flaws and, for me at least, oscillated between frustrating and genuinely enthralling. The novel opens with the monk Raidon Kane as he returns home to his adopted daughter. The reader gets a brief introduction to the character, with the aid of his mother’s amulet he hunts abberant creatures; those things that D&D pilfered from the mind of H. P. Lovecraft. It isn’t long before disaster strikes as the Spellplague rips through Faerun destroying everything in its path. Well, almost anything since Raidon somehow manages to be saved, thanks in some part to his mystical amulet of the Cerulean Sign. Unfortunately it is while before we see Raidon again and we bounce back and forth between several other characters before the monk makes his appearance. The monk is drafted, almost press-ganged, into a war against a greater threat of an elder evil while at the same time he must shift through the ashes of his own past while trying to come to grips with the vastly changed face of Faerun. My primary complaint with the first 4th Edition Realms novel Swordmage was that it did little to actually explore the changed Realms. Spell of Plagues, thanks to the time-displaced Raidon Kane, offers a much better opportunity explore the changed face of Faerun and provides more answers, and encourages more speculation on the new setting than Swordmage ever did. As a piece of fiction reinforcing another product Plague of Spells is a treasure trove of ideas that simulatneously examines the wonder and the horror of the new Forgotten Realms both in terms of the radical changes to the setting and the mechanical differences between the old versions of Dungeons and Dragons and the current 4th Edition of that game. As a result the novel doesn’t always feel as solid a work of fiction as it should despite being treasure trove of ideas for the would be DM. I should note that one of my favorite 3.5 supplements was the book Lords of Madness: the Book of Aberrations from a series of D&D books that worked to flesh out various types of monsters. Furthermore, as a long-time fan of H. P. Lovecraft I have soft spot for “horror from beyond the universe” concept and tend to gravitate towards those same type of enemies in my own gaming. Plague of Spells makes use of those elements to varying degrees of success though ultimately focusing on the “wow” factor over the sense of slowly dawning unease and horror that it is the trademark of Lovecraftian fiction. This isn’t necessarily a bad thing, but it should be something you know going if you’re expecting a more Lovecraft-tinged D&D story. Plague of Spells’ strongest aspect and greatest weakness is its characters. Cordell manages to create a fascinating and complex character out of Raidon Kane. His initial portrait as a righteous warrior and family man is solid and the pain and loss when the Spellplague tears all that away makes for a character that is both formidable and empathetic. For the long-time Realms fan Raidon Kane is a surrogate whose horror, confusion, and disorientation at the changed nature of his home is a mirror for the reader’s lack of knowledge regarded the new Forgotten Realms. Japheth, a warlock is perhaps the other really compelling character. A former scribe he made a deal with a powerful entity for great power, bargained his soul away in the process, then proceeded to screw over his master in the end. He is a character that walks a razor edge, managing a heavy weight drug addiction while trying to remain one step ahead of his revenge-seeking Fey patron. Japheth and Raidon are 2/3 of the novel’s perspective, the remain POV is that of the noble-born Anusha. Anusha, demonstrates early on the strange ability to project her dream-self into the waking world. Despite her interesting ability I found Anusha to be the least compelling character of the bunch. She feels too often like the most cliched of the bunch and comes off as a bit immature and her and Japheth’s growing attraction/romance is a bit hard to swallow. Despite the well-developed characters of Japheth and Raidon I was disappointed that most of the secondary characters surrounding them feel a little flat. Thoster, the “tainted” pirate captain comes perhaps the closest to being the most interesting of the background characters, but no other characters ever manage to achieve the same depth of characterization of back-story as either Raidon or Japheth. To make matters more difficult I found the split POV between Japheth, Anusha, and Raidon to be weighted a bit heavily on Japheth/Anusha end. Indeed after our initial introduction to Raidon it is another three chapters before we see him again. I felt that Raidon, despite being our protagonist, had surprisingly little screen time and too much of the story was given over to the events occuring around Japheth and Anusha. If you’re not really a Dungeons and Dragons fan I don’t think I can really recommend Plague of Spells. It has the potential of being something really good but it is a potential that remains largely unfulfilled. Cordell shows a deft hand at action scenes and includes some fascinating concepts: a sentient golem and the use of the Cerulean Sign mark high points for, as well as Cordell’s description of Raidon’s monk abilities all showcase a wonderful creative flair. 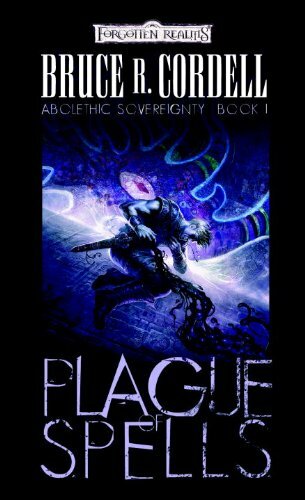 The setting, a mere 10 years after the Spellplague (rather than the editorial mandated 100) provides for a fascinating backdrop that delves a bit deeper into the magical catastrophe and lends an air of desperation and confusion to the title that enhances the somewhat horrific atmosphere. If you’re a Realm’s fan unsure of how the Spellplague has changed you favorite setting I can at least recommend Plague of Spells as an excellent place to explore that concept and as a great place to farm for ideas as a DM. Unfortunately, absent of its D&D trappings I’m afraid that Plague of Spells is a much weaker work of fictionand, with much of it’s creative drive designed to explain “crunch,” the novel will most definatley not appeal to readers unfamiliar with the current edition of Dungeons and Dragons.